Police Commissioner Charles Ramsey said Wednesday that he will retire after a 47-year career in law enforcement as the administration of the mayor that brought him to the city comes to an end. Mayor Michael Nutter brought the 65-year-old Ramsey to Philadelphia in 2008 when he took office after stints in Washington and his native Chicago. The city’s next mayor will take office in January. Ramsey said at a news conference attended by Nutter and other city officials that his last day would be Jan. 7. The number of homicides in the city has fallen from 391 in 2007, the year before Ramsey became commissioner, to 248 last year. This year has already eclipsed last year’s murder rate, with 216 as of Tuesday. From 2008-14, there were an average of 299 killings per year. 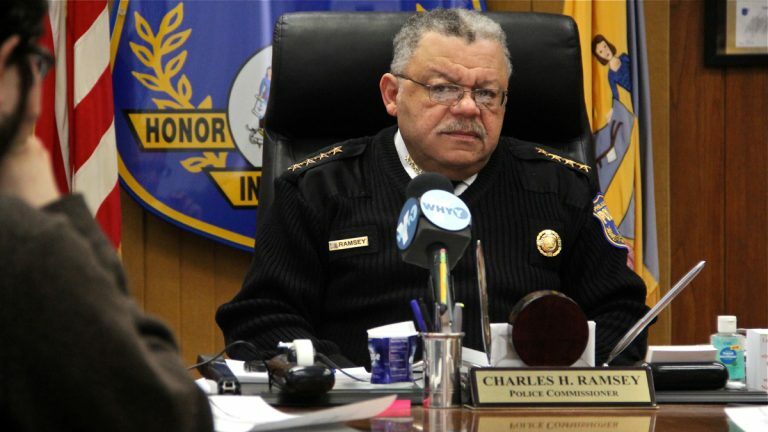 Ramsey was co-chairman of the policing task force formed by President Barack Obama after the fatal police shooting last summer of 18-year-old Michael Brown in Ferguson, Missouri. The panel has recommended dozens of changes in training, transparency and outreach, many of which Ramsey said Philadelphia would implement. “Thank you for coming to Philadelphia and thank you for making my city a safer city,” Nutter said. Ramsey started outfitting officers with body cameras in January, has moved more officers onto foot and bicycle patrols in crime-ridden communities and broadly expanded the department’s use of surveillance video and social media. Ramsey has been criticized for the department’s use of stop and frisk— a tactic mayoral front-runner Jim Kenney, a Democratic former city councilman, wants ended. Ramsey said he only supports lawful stops called Terry stops, named after a 1968 Supreme Court ruling upholding an officer’s right to pat down a person suspected of criminal activity. There is no department policy encouraging stop and frisk, he said. Ramsey was chief of the Metropolitan Police Department of the District of Columbia from 1998 to 2007. During his stint, his department investigated the disappearance and death of Washington intern Chandra Levy. Levy’s 2001 disappearance created a national sensation after the 24-year-old California native was romantically linked with then-U.S. Rep. Gary Condit. Condit, a California Democrat, was ultimately ruled out as a suspect. Crime rates fell about 40 percent during his tenure in the nation’s capital, with community policing, improved hiring practices and better training and equipment cited as reasons for the improvement. Ramsey also established a 3-1-1 non-emergency reporting system and established a website to make crime information reports available to the public. Ramsey joined the Chicago Police Department as an 18-year-old recruit in 1968. He rose through the ranks to become Chicago’s deputy superintendent of police. Ramsey, who is black, had been tasked with hiring more black officers in Philadelphia where 44 percent of residents are black. The reviews were mixed. This summer, the Philadelphia Daily news reported that more than 1,200 officers had been hired under Ramsey, about 64 percent of them white. Black officers account for 248 of the new hires, with about 15 percent being Hispanic, Asian or other races. Ramsey said finding qualified black candidates had become increasingly difficult because of a requirement that recruits have 60 college credit hours. Kenney had called Ramsey one of the best police commissioners the city had ever had. Kenney is considered the odds-on favorite to win next month’s mayoral election because of the city’s large Democratic voter edge. He has said he would pick someone from inside the department to take over if Ramsey didn’t remain in the job.